"Wonderful example of a city built with a Renaissance style which preserves intact its old town centre": for this reason the historic centre of Ferrara has been declared in1995 by the UNESCO as part of the "World Heritage List". 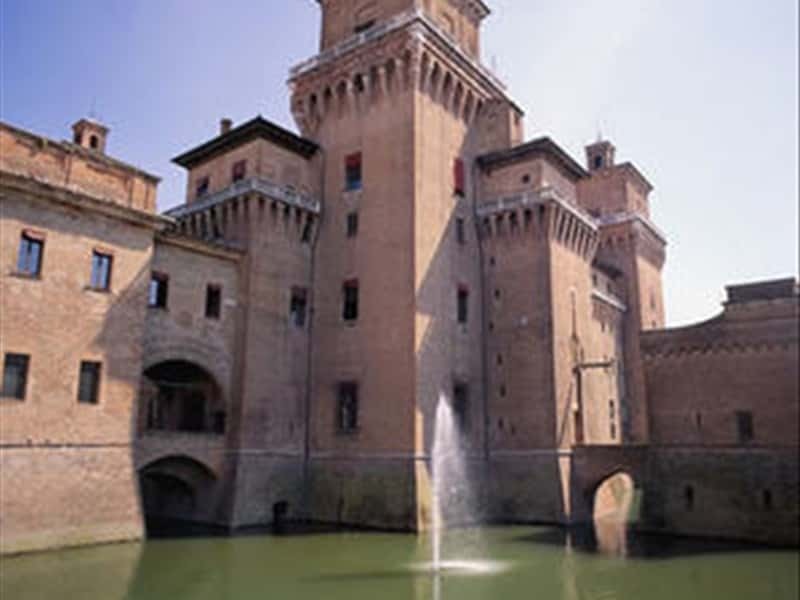 Situated in the lower part of the Emilia region plain, Ferrara was named for the first time in a document, dated 753, of Desiderio, King of the Longobardi. Over the centuries the city was ruled by various masters, until it gained its own liberty and proclaimed its own city council. It was scenario of civil wars between the Guelfi, captained by the Adelardi Family, and the Ghibellini, guided by the Torelli-Salinguerra Family. A third Family Party, the Estensi, took advantage of this difficult situation and after some major difficulties, they obtained the Lordship. This Leadership of the Estensi continued for nearly three centuries and Ferrara became an active cultural city, where artists such as: Piero della francesca, Pisanello, Leon Battista Alberti, Mantegna, Cosmè Tura, Bellini, Tiziano, Ludovico Ariosto, Torquato Tasso, found hospitality at the Court of the Este Family and devoted their works to the city and its minds. The fortified wall, a red screen of bricks, which stand out of the surrounding green, surrounds the old city for 9 kilometers and is one of the largest defense curtains of the Middle Ages and the Renaissance. The Estense Castle or Castle of San Michele, is one of the most rappresentative monuments of the city: built in 1385 by Bartolino of Novara, ordered by Niccolò II d'Este, had only defense purposes. Under Ercole I, it became his Court's residence and was enriched with wall frescos and balconies. The towers, built at the four corners of the Castle, stand out over the city and are the symbol of the strength and magnificence of the Este Family. At North-West the Tower of Santa Caterina, at North-East the wonderful Tower of the Lions, panoramic location from where it is possible to admire the whole city, at South-East the Tower Marchesana and at South-West the Tower of San Paolo. The Cathedral of San Giorgio is one of the most important historic buildings of the city; built at different stages, beginning from the XII century, it proposes artistic styles of different periods. The large façade in Gothic-Romanesque style, offers important features such as lodges, archways, statues, rose windows and bas-reliefs. On the Piazza Trento-Trieste stands the Renaissance style Bell Tower in white and pink marble, a non-completed work of Leon Battista Alberti. The winding roads of the Middle Ages and the important ones of the Renaissance period are surrounded by historic buildings with façades rich of ornaments, shining marbles and cotto pavements such as: Palazzo dei Diamanti, seat of the National Art Gallery, Palazzo Turchi di Bagno, Palazzo Prosperi-Sacrati, Palazzo Bevilacqua-Costabili, Palazzo Schifanoia, Palazzo Bonacossi and Palazzo di Renata di Francia, which are real architectural gems. This town web page has been visited 56,693 times.